Introduction: Matrix metalloproteinases (MMPs) play a significant role in the efficient tissue turnover and remodeling. This study focuses on the regulation of the MMPs by the protein kinases at the level of gene expression and their signaling pathways. 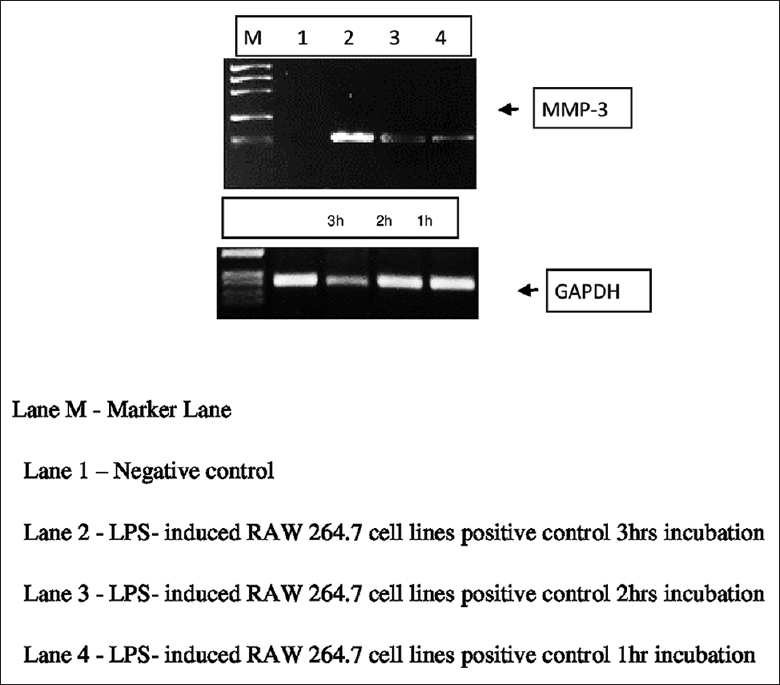 Materials and Methods: Lipopolysaccharide-induced murine macrophage-like RAW 264.7 cell lines were obtained and maintained in Dulbecco's modified Eagle's medium plus 10% fetal bovine serum under optimal temperatures. Primers used were MMP-3 forward primer, MMP-3 reverse primer, and glyceraldehyde-3-phosphate dehydrogenase forward primer and glyceraldehyde-3-phosphate reverse primer. Total RNA was isolated, the sample was prepared, and electrophoresis was performed. The first strand of cDNA was synthesized and amplification of specific isolated gene using polymerase chain reactor (PCR). The amplified products were then separated on a 1.0% agarose gel in 1XTBE at 75 V for 3 h. The gel was stained with ethidium bromide, and the amplified product was visualized and photographed on Gel Doc system. Results: Real-time PCR showed only bands at expected size of 595 bp for internal control amplification of glyceraldehyde-3-dehydrogenase gene. Analysis was done with densitometry, and these values are compared with the negative control. Results showed a statistically significant rise in the relative levels of MMP-3-mRNA when compared with negative control at 1, 2, and 3 h.
Conclusion: This study proved the significantly increased levels of MMP gene at different period, thereby it can be concluded that MMP-3 levels are higher in inflammatory conditions. The primer design is carried out with the aid of Primer Software. All the primers were synthesized from Sigma Genosys, Bangalore, India [Table 1]. M-MuLV Reverse Transcriptase and RNase Inhibitor were purchased from Fermentas (Thermo Scientific). Add the following components in sterile nuclease-free tube [Table 2]. About 2 μl of reverse transcription reaction product from the above reaction was used for polymerase chain reactor (PCR) amplification [Table 3]. Real-time PCR (RT-PCR) shows only bands at expected size of 595 bp for internal control amplification (GAPDH gene) [Figure 1] and [Figure 2]. Jain A, Bahuguna R. Role of matrix metalloproteinases in dental caries, pulp and periapical inflammation: An overview. J Oral Biol Craniofac Res 2015;5:212-8. Nagase H, Woessner JF Jr. Matrix metalloproteinases. J Biol Chem 1999;274:21491-4. Le NT, Xue M, Castelnoble LA, Jackson CJ. The dual personalities of matrix metalloproteinases in inflammation. Front Biosci 2007;12:1475-87. Mazzoni A, Papa V, Nato F, Carrilho M, Tjäderhane L, Ruggeri A Jr., et al. Immunohistochemical and biochemical assay of MMP-3 in human dentine. J Dent 2011;39:231-7. Palosaari H, Ding Y, Larmas M, Sorsa T, Bartlett JD, Salo T, et al. Regulation and interactions of MT1-MMP and MMP-20 in human odontoblasts and pulp tissue in vitro. J Dent Res 2002;81:354-9. Heidi P. Matrix Metalloprotienases (MMPs) and their Specific Tissue Inhibitors (TIMPs) in Mature Human Odontoblasts and Pulp Tissue: The Regulation of Expressions of Fibrillar Collagens, MMPs and TIMPs by Growth Factors, Transforming Growth Factor-[beta]1 (TGF-[beta]1) and Bone Morphogenic Protien-2 (BMP-2). Finland:Oulu University Press; 2003. p. 17-82. Shin SJ, Lee JI, Baek SH, Lim SS. Tissue levels of matrix metalloproteinases in pulps and periapical lesions. J Endod 2002;28:313-5. Muromachi K, Kamio N, Matsuki-Fukushima M, Narita T, Nishimura H, Tani-Ishii N, et al. Metalloproteases and CCN2/CTGF in dentin – Pulp complex repair. J Oral Biosci 2015;57:86-90. Zheng L, Amano K, Iohara K, Ito M, Imabayashi K, Into T, et al. Matrix metalloproteinase-3 accelerates wound healing following dental pulp injury. Am J Pathol 2009;175:1905-14. Ding Y, Uitto VJ, Haapasalo M, Lounatmaa K, Konttinen YT, Salo T, et al. Membrane components of treponema denticola trigger proteinase release from human polymorphonuclear leukocytes. J Dent Res 1996;75:1986-93. Wahlgren J, Salo T, Teronen O, Luoto H, Sorsa T, Tjäderhane L, et al. Matrix metalloproteinase-8 (MMP-8) in pulpal and periapical inflammation and periapical root-canal exudates. Int Endod J 2002;35:897-904. Tjäderhane L, Larjava H, Sorsa T, Uitto VJ, Larmas M, Salo T, et al. The activation and function of host matrix metalloproteinases in dentin matrix breakdown in caries lesions. J Dent Res 1998;77:1622-9. Hong CY, Lin SK, Kok SH, Cheng SJ, Lee MS, Wang TM, et al. The role of lipopolysaccharide in infectious bone resorption of periapical lesion. J Oral Pathol Med 2004;33:162-9. Leonardi R, Caltabiano R, Loreto C. Collagenase-3 (MMP-13) is expressed in periapical lesions: An immunohistochemical study. Int Endod J 2005;38:297-301. Sikand K, Singh J, Ebron JS, Shukla GC. Housekeeping gene selection advisory: Glyceraldehyde-3-phosphate dehydrogenase (GAPDH) and β-actin are targets of miR-644a. PLoS One 2012;7:e47510. Manicone AM, McGuire JK. Matrix metalloproteinases as modulators of inflammation. Semin Cell Dev Biol 2008;19:34-41. Kumar MS, Vamsi G, Sripriya R, Sehgal PK. Expression of matrix metalloproteinases (MMP-8 and -9) in chronic periodontitis patients with and without diabetes mellitus. J Periodontol 2006;77:1803-8. Venugopal A, Uma Maheswari TN. Expression of matrix metalloproteinase-9 in oral potentially malignant disorders: A systematic review. J Oral Maxillofac Pathol 2016;20:474-9. Hill PA, Murphy G, Docherty AJ, Hembry RM, Millican TA, Reynolds JJ, et al. The effects of selective inhibitors of matrix metalloproteinases (MMPs) on bone resorption and the identification of MMPs and TIMP-1 in isolated osteoclasts. J Cell Sci 1994;107(Pt 11):3055-64. Everts V, Delaissé JM, Korper W, Niehof A, Vaes G, Beertsen W, et al. Degradation of collagen in the bone-resorbing compartment underlying the osteoclast involves both cysteine-proteinases and matrix metalloproteinases. J Cell Physiol 1992;150:221-31. Kusano K, Miyaura C, Inada M, Tamura T, Ito A, Nagase H, et al. Regulation of matrix metalloproteinases (MMP-2, -3, -9, and -13) by interleukin-1 and interleukin-6 in mouse calvaria: Association of MMP induction with bone resorption. Endocrinology 1998;139:1338-45. Beidler SK, Douillet CD, Berndt DF, Keagy BA, Rich PB, Marston WA, et al. Multiplexed analysis of matrix metalloproteinases in leg ulcer tissue of patients with chronic venous insufficiency before and after compression therapy. Wound Repair Regen 2008;16:642-8. Liu Y, Min D, Bolton T, Nubé V, Twigg SM, Yue DK, et al. Increased matrix metalloproteinase-9 predicts poor wound healing in diabetic foot ulcers. Diabetes Care 2009;32:117-9. Menezes-Silva R, Khaliq S, Deeley K, Letra A, Vieira AR. Genetic susceptibility to periapical disease: Conditional contribution of MMP2 and MMP3 genes to the development of periapical lesions and healing response. J Endod 2012;38:604-7.